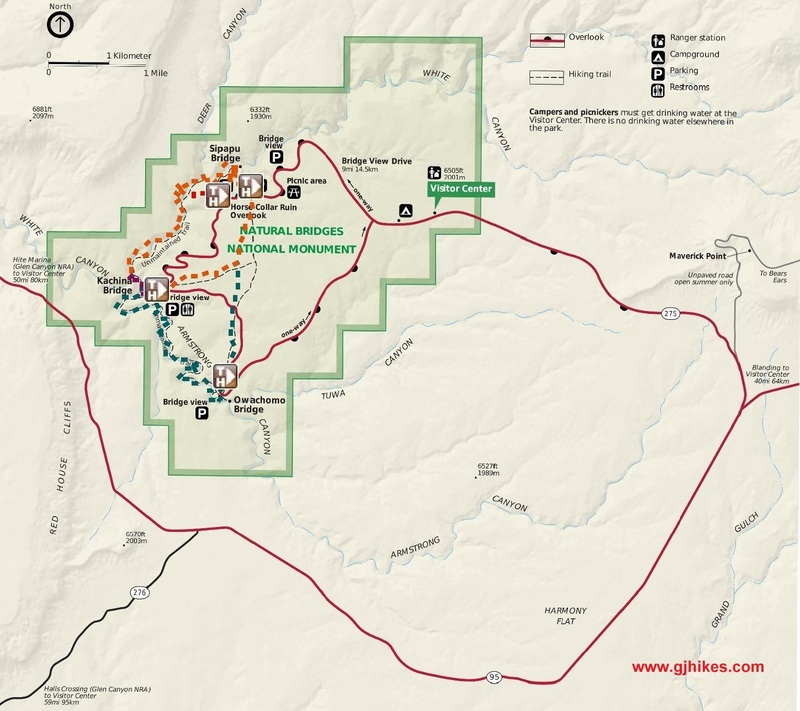 The Horsecollar Ruin Overlook trail is located in Natural Bridges National Monument. Natural Bridges is roughly 35 miles west of Blanding, Utah. As the first national monument in the state of Utah Natural Bridges protects the 3 Hopi Indian named bridges of 'Sipapu', 'Kachina' and 'Owachomo'. The monument includes a campground and a visitor center with a gift shop, displays and flush toilets. The Ancestral Puebloans, or Anasazi, inhabited this area for over 1000 years beginning around A.D. 1. They moved out of this area around the year 1300. The facts that so little is really known about this people and that what they built has endured for over 700 years makes this a very significant location to visit. 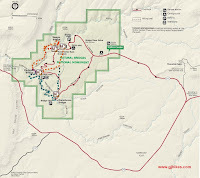 The trail is very easy to follow from the parking area to the overlook on the canyon rim. The trail is mostly flat with a small rise in the middle and a short descent at the end to the overlook. There are places where you can walk out onto the slickrock and peer down into White Canyon. There is a trail in the bottom of the canyon that leads from Sipapu Bridge. This area doesn't have a protective fence so you will need to be sure to keep an eye on small children. The last part of the trail wraps around a nice section of slickrock and has a good guardrail to protect hikers from the steep drop off. From the overlook there are several sheltered alcoves that contain ruins. The Horsecollar ruin gets its name from the shape of the doorways into the granaries. To the left of the granaries is a dwelling built around several boulders that still has most of its roof. Dwellings with intact roofs are extremely rare. This one has enough material worn away that it is easy to see the overall construction. The masonry in some of the other dwellings are also holding up quite well. Most visitors come to Natural Bridges to view the geology but the Indian ruins and rock art are a great bonus. You will need to hike down into the canyons to see the petroglyphs and pictographs. A pair of binoculars and a good telephoto lens are worthwhile accessories for the Horsecollar Ruin Overlook trail. These are excellent ruins and the scenic canyon overlooks are spectacular and it will all only add about half an hour to your visit. If you would like to see it for yourself then all you have to do is 'Take a hike'.